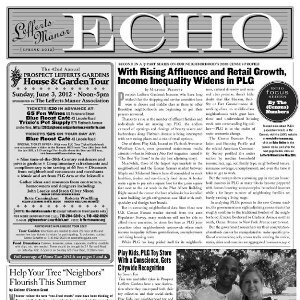 The Spring issue of the Lefferts Manor Echo newsletter is available now for downloading. It is full of great articles on our upcoming House Tour and the neighbors and local area businesses that make PLG and Lefferts Manor a great place to live. You will be able to pickup a paper copy at The Blue Roost Petit Cafe at 43 Lincoln Road, the Thriftway Pharamacy at Lincoln and Flatbush, Ace French Cleaners between Maple & Midwood, The Smile for Every Sistah in You Clothing Boutique at 581 Flatbush, Tafari Tribe Globe Trade at 593 Flatbush, and 65 Fen the wine store.